As part of this year's annual Coasteering Workshop in Pembrokeshire, we contributed to the elements of Incident Management. The outcomes of the Workshops are applicable to all watersports activities including Coasteering, Rafting Kayaking and Canoeing. Whilst First Aid is very easy to apply to a simple urban setting, we are faced with more complex issues surrounding the situation when operating in a remote environment. One of the most difficult situations to manage can be that of a casualty in the water as the environment can pose an immediate danger to not only the casualty but to yourself and others in the group. 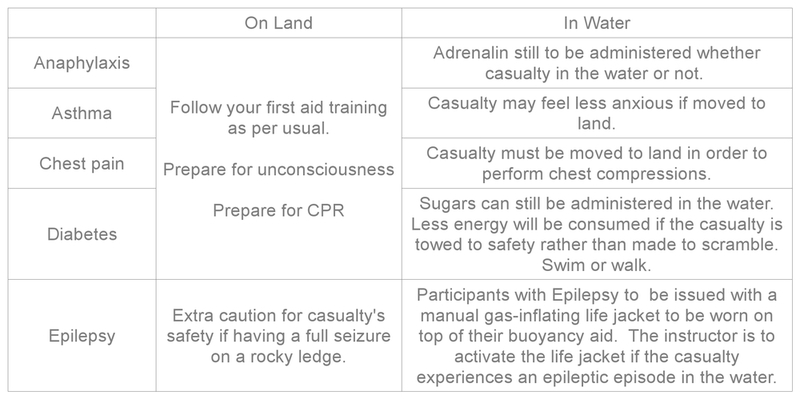 Rather than creating a new protocol from scratch, it is always worth building on the existing 'ABC' of First Aid which most people will already be familiar with. Using the case study of the death of Laura McDairmant as an example, it can be seen that many Dangers can be reduced or removed by robust safety policies and practices. During the workshop the group explored ways of managing risk before the activity rather than during an Incident. Periodically review Standard Operating Procedures (SOPs), Emergency operating procedures (EOPs) and Risk Assessments (RAs). This should be done as a group with all members of staff, including admin / office staff. Review who in your organisation takes responsibility for the above. Freelance staff should be encouraged to share, and question, differences between organisations' SOPs, EOPs and RAs (for example, maximum jump heights). Experienced Instructors have a position of influence over inexperienced instructors, not just in instructing technique or activity specific skills but also encouraging a 'culture of safety'. Experienced Instructors and Organisations should be receptive to new ideas from inexperienced Instructors. Sometime we find we are doing things 'because they have always been done this way'. While new instructors may lack site-specific experience they can bring fresh ideas or transfer good practice from other disciplines. Recording activities in a Log Book not only provides evidence for NGB awards but also provides a written record should an instructor be required to provide evidence following an Incident. Be diligent; great emphasis is placed on the recording of accidents in the Accident Book but the Near Miss book provides evidence of trends which can be predicted before an actual incident occurs. There is a misplaced concern that an organisation with a considerable amount of recorded accidents (or an Instructor who has entered a considerable amount of Near Misses) will be unfavourably judged. In reality, the HSE is suspicious of Organisations with empty Accident Books; accidents happen and an empty Accident Book is far more incriminating than a well documented one. Placement of the Near Miss and Accident Books; These should be accessible by everyone and their location communicated. A safe group can be left while you deal with the casualty. A safe group may be able to assist you with the casualty. Managing a situation on our own is possible but our interventions may be limited to short-term and/or only life saving treatment for the casualty. With the help of the group we may be able to offer more effective, longer-term or more appropriate management. Instructors should follow the protocols they received during their First Aid or Life Saving training, however, it is usually only possible to move an casualty from water to a river bank or raised ledge (regardless of the condition of the water or height) with the help of others. Follow guidelines and remain in the water with the casualty, monitoring their breathing and protecting their airway. allows CPR to be performed if the casualty stops breathing. The 'Gold Standard' treatment for this casualty would be full body immobilisation; this is only possible on land and best performed with a minimum of four competent people. It would be impractical and potentially dangerous to attempt to remove a casualty from the water to a raised ledge but may be possible to 'float' the casualty to the shore where they can be moved up the beach whilst spinal and airway management is maintained. Dealing with a casualty on land and with help affords us the opportunity to apply definitive treatment in terms of properly immobilising the affected limb as well as providing physical support or manual handing to help move the casualty. With a casualty in the water we are much more limited in our treatments which may range from nothing to merely holding or supporting the casualty in a comfortable position. 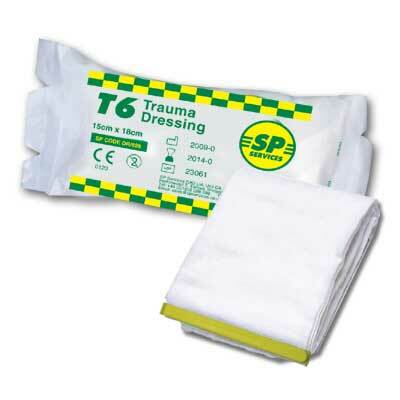 Two products that were used were the SAM Splint and the Israeli style trauma bandage. A SAM Splint is a soft, malleable aluminium sheet sandwiched between thin foam. This is moulded to the casualties affected limb and held in place, either with tape, cling film or a firm bandage. The benefits of the splint are that is is light, compact, quick and easy to use and unaffected by water making it ideal for watersports activities. quick and easy to apply with a convenient plastic clip. These are available from www.spservices.co.uk product code DR/826. The cause for concern regarding the treatment of Common Medical Conditions was whether the casualty being in the water would alter our treatment. All medications can be given regardless of the casualty's situation. Always prepare for a Common Medical Condition to get worse; as such prepare for unconsciousness and / or for breathing to stop. To this end the casualty may be safer on dry land. CPR can only be performed on a firm surface so these casualties should be moved to land as a priority. A casualty with epilepsy my be safer in the water provided they have manual gas-inflating life jacket which can be activated by the instructor. In terms of environment, our concern is Hypothermia, whether the casualty is in the water or on land. 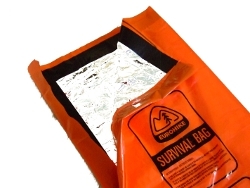 Survival Bags and 'space blankets' both have there pros and cons but it is worth considering splitting a survival bag along one side and taping a foil space blanket to the inside to create something which is not only warmer but also easier to get an unconscious or immobile casualty into. When a casualty is in the water (not flowing or fast moving water) there was discussion about putting the casualty into a survival bag to keep a small body of warm water around the casualty. This was not tested but is worth exploring further. Two practical scenarios were played out in real-time; rather than focusing on the treatment of the casualty, the onus was on the management of the scenario, especially the safety of the group. The first scenario involved an ankle injury following a jump from height. The second scenario was a head injury following a simple slip. “I need an ambulance (E); We're at the towers at Abereiddy (E). We have got one casualty (N) who has been involved in a fall (T). There are no hazards (H) but access will only be made from sea or the cliffs above us (A). The most notable feature of the scenario was that in both instances the 'call for help' was not made until , the leader of the group had managed their safety, the safety of others and dealt with the immediate problems of the casualty. This, hopefully, demonstrated how involved managing a situation can be time consuming; neither incident was particularly complicated but some activities – especially moving people – always takes longer than anticipated.